Reporters at Bloomberg have stated that Elon Musk was considering Texas to be the site for the first Hyperloop model. This could be amazing for Texans, although it would not fix the dismal transportation problem that still impacts the sprawling DFW metroplex. Arlington is the largest city in the United States without a public transportation system. There are no public buses [for non elderly] and the railway system named the TRE express skips Arlington altogether since the city refused to chip in to the maintenance budget. With the completion date of the privately funded Tollway complex that webs through the area approaching quickly, I suspect many people may opt not to use the toll ways as to travel any measurable distance will be quite expensive especially with variable toll prices at peak hours [want to skip a block of traffic? $8 please!]. 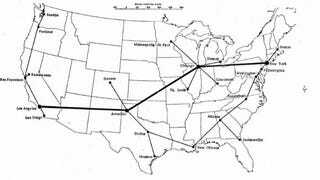 Having alternative means to travel quickly between cities like Dallas and Houston, Corpus Christie and Austin could open a new market which would help competitiveness of these systems - granted the science and prototype units work and an economical price tag accompanies a ticket on said Hyperloop. Musk has been pretty quiet about the specifics while others have conjectured how the design might be possible. Nonetheless it still is a reason to be excited and hopeful that something revolutionary could result from his project.